West Nile Virus (WNV) has recently become endemic to the Western hemisphere. WNV is maintained in nature in a mosquito-bird-mosquito transmission cycle. Mosquito vectors infect hosts while injecting pathogen laden saliva as part of the blood meal extraction process. 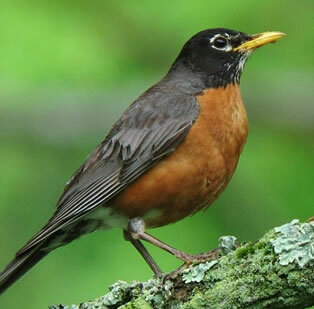 The American robin is the preferred early-season host and the sparrow is the preferred late season-host of the Culex mosquito species which are the primary WNV vectors in North America (Kent 2009). Approximately 80% of WNV infected persons have no symptoms of disease. About 20% of infected people develop mild symptoms that may include: fever, headache, tiredness, and body aches, nausea, vomiting, skin rash and swollen lymph glands. About 1 in 150 WNV infected persons will develop severe neuroinvasive disease, i.e. encephalitis, meningitis, acute flaccid paralysis, or other acute signs of central or peripheral neurologic dysfunction. Age 50+ and the immunocompromised are at increased risk. In 1999 a significant outbreak of WNV neuroinvasive disease was identified in the New York city area. A coincident die off of corvid birds served to further heighten concern. Initially, St. Louis encephalitis was suspected, but tests on the birds confirmed West Nile Virus (WNV). Until then, WNV had not been confirmed the Western hemisphere. New York public health officials understood the threat posed by WNV. They implemented mosquito eradication programs, fearing that WNV would spread as the birds migrated south. Those fears proved to be well founded. Despite their efforts, the disease spread south, north and west as well. By the end of 1999, WNV had been detected in 4 states; by 2000, it had spread to 8 states; and by 2001, to 22 states and Ontario, Canada. In 2002, the greatest number of cases were in Illinois; in 2003, in Colorado; and in 2004, in California, showing the inexorable march of the infection across the United States. As of October 31, 2017, a total of 47 states and the District of Columbia have reported West Nile virus infections in people, birds, or mosquitoes in 2017. Overall, 1,697 cases of West Nile virus disease in people have been reported to CDC. Of these, 1,121 (66%) were classified as neuroinvasive disease (such as meningitis or encephalitis) and 576 (34%) were classified as non-neuroinvasive disease. The CDC recommends that West Nile virus (WNV) disease should be considered in any person with a febrile or acute neurologic illness who has had recent exposure to mosquitoes, blood transfusion, or organ transplantation, especially during the summer months in areas where virus activity has been reported (CDC). 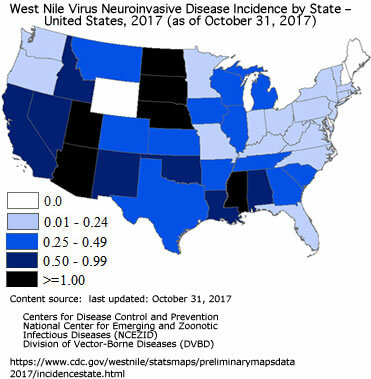 Click here to find your county's average annual incidence of WVN neuroinvasive disease reported to CDC by county, 1999-2016. WNV has spread quickly since 1999, infecting thousands of people in North America. CDC. West Nile Virus. Home. For Health Care Providers. Clinical Evaluation & Disease. Diagnosis & Reporting. Kent R, Juliusson L, Weissmann M, Evans S, Komar N. (2009) Seasonal blood-feeding behavior of Culex tarsalis (Diptera: Culicidae) in Weld County, Colorado, 2007. J Med Entomol. 46(2):380-90.